If you’ve ever searched Amazon for bed pillows, you know how many options there are. Hundreds, and hundreds, and hundreds. That’s why when a pillow gets a coveted “Amazon’s choice” designation, you know beyond a shadow of a doubt that it’s the real deal. 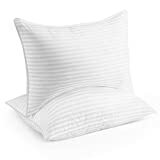 And if for some reason that’s not enough to convince you that Beckham Hotel Collection Gel Pillows are fantastic, check out the 3,200+ 5-star reviews they have on Amazon. At an all-time low of $29.99 for a two-pack, these pillows can’t be beat.